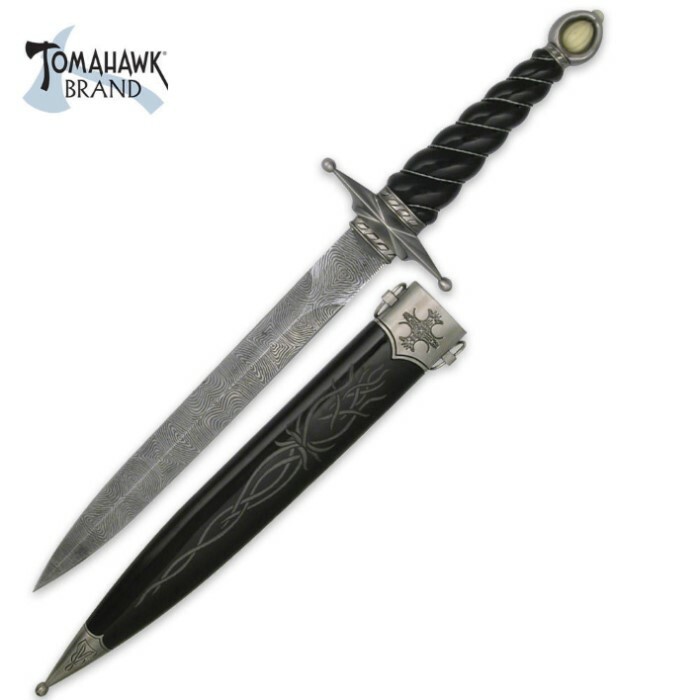 This replica medieval dagger is a great show piece for the historical collector or it can be used by chivalric re-enactors. This dagger features a 10 1/4" stainless dagger crafted on a traditional design. The handle offers a cast metal guard and pommel, and composite spiral grip with steel wire wrap. This item measures 16 1/4" overall and includes a coordinating sheath. The tip of the dagger is sharp but the rest of the blade is fairly dull and it looks almost like its made of plastic. It's a nice costume piece, surprisingly solid piece for the price. It has no edge and I am not sure you could give it one. This dagger is quite a bit larger than you'd think from the picture. Like the other reviewer said, it's really more a short sword. The handle on mine is kind of scuffed but it's all tightly assembled and there are no rattles. The blade is halfway sharp and is an obvious, but not ugly, reproduction of damascus steel. While the sheath and handle are plastic, this is still a nice dagger! It's size is pretty impressive for the price. It was a lot bigger than I expected a few inches bigger and this would be a short sword. Nice design on the blade too!